Summer 2017. 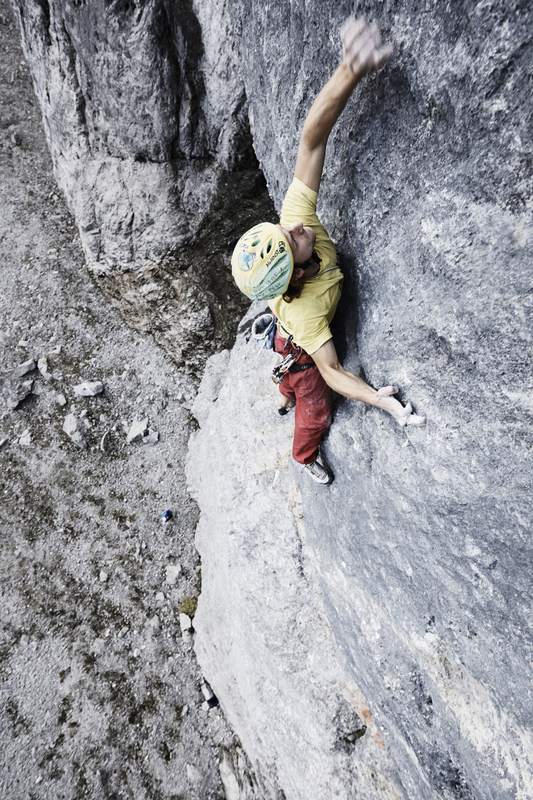 Henry Francis, Paul Sass, Toni Lamprecht and me climbed a new route: Alexandra Supernova on Pik 4800. The mountain Pik 4800 is located in Lajlak-valley, Kyrgystan where is also the big Aksu mountain. Summer 2015. Sebastian and me finished so far our biggest route near home. It’s a long route through an obvious yellow-white shield of a wall called „Spritzkarspitze-Nordwand.“ We bolted the line ground up in alpine style. Having some awesome climbing days and spending the night in the porter ledge. Although it’s a north-facing wall – it is too warm to climb in the morning….. The route goes through amazing limestone. The jewel of the route is a 5m overhang in the 7th pitch . After a lot of days spending with bolting and trying the route we managed the first ascent. 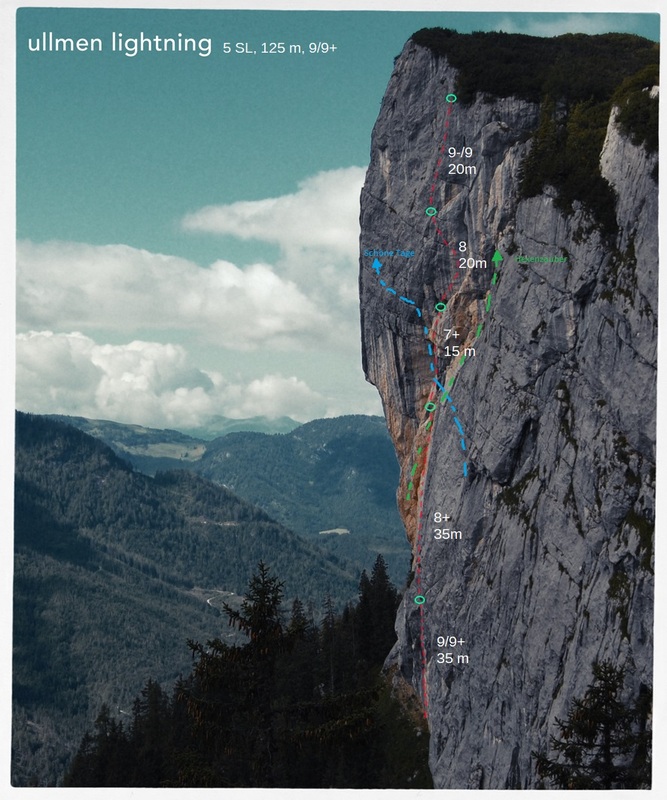 On 27th/28th 2015 of August Sebastian and me climbed the 600m and 16 pitches free and red point. „Wilde Freiheit“ – Karwendel – Project…..finished! 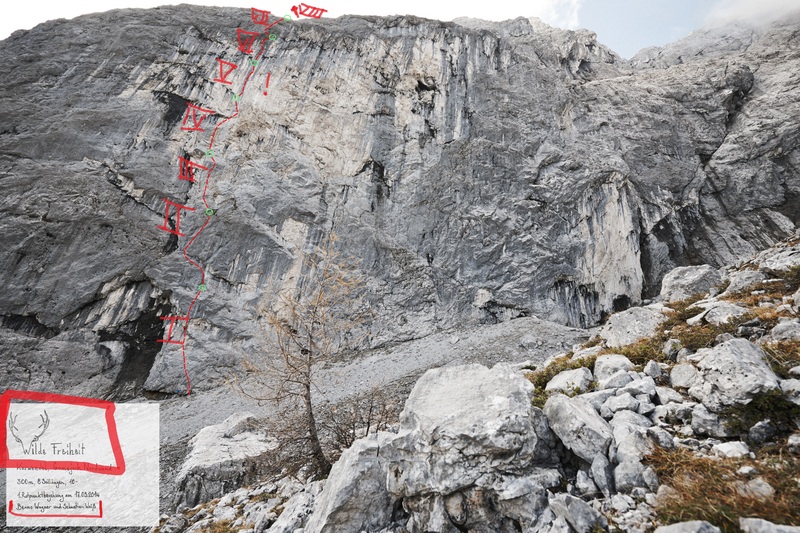 Wilde Freiheit, is the name of the new alpine multi-pitch route in Karwendel. Sebastian and me startet this project in autumn 2013. This brilliant route goes up the north face of a mountain called Gamsjoch. It’s located in the Ahornboden in Karwendel, a northern region of the alps. Anmarsch/ Walking up to Gamsjoch Nordwand. In the background the famous „Ahornboden“ maple tree valley just without leaves. The route is protected with bolts. But in between them you still get the chance to climb some exciting runouts. The quality of the rock is stunning. The climbing goes up in different styles in often steep rock. In all, the wall bulgs about 20m. So especially in the 6th and 7th pitch you can enjoy the exposed wall in steep terrain. Benno in the crux of the first pitch. The crux oft the route is the 5th pitch. This 8a+ pitch is 30m long. Amazing moves. Pumpy first 20m followed by a good rest and than a tricky boulder passage clears the way to the next belay. 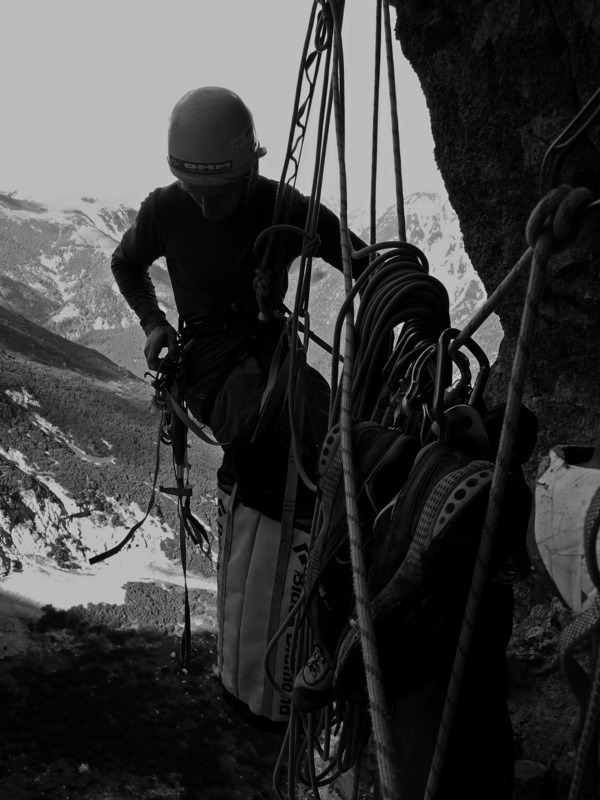 The following pitches are increadable steep, you climb in overhanging rock, gaining more and more „Luft unterm Arsch“. One of the most beautiful sea cliff routes I’ve climbed in North Wales: Deep Sea Spex. I had to wait long time. Most of the time I walked to the cliff and had a look into the route I was disappointed to see the route in wet conditions. But it was worth to came to this amazing place again and again. The first time it was dry I felt in the middle of the first pitch . The second day I found the route in dry conditions I managed to climb it. The style of climbing is amazing, it changes from „head-jamming“, to crimps and wonderful hand jams.